Personal injuries and accidental deaths are traumatic and destabilizing for both victims and family members. Besides the physical and emotional hurdles, people often face severe, long-term financial challenges. The Finn Financial Group can help you establish financial stability through a special benefit that the federal government gives to those in need…a structured settlement. A structured settlement provides unequaled financial security to personal injury victims and their families…guaranteeing financial peace of mind. Using a customized payment plan guaranteed by a highly rated life insurance company, a structured settlement provides long-term benefits which flow to the individual on an income tax-free or tax-deferred basis. 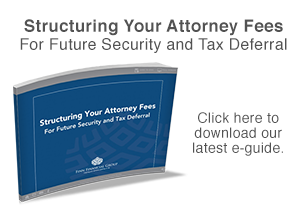 Encouraged by Federal Tax Law – Internal Revenue Code Sections 104(a)(1) & (2) permit accident victims to receive their settlement proceeds 100% income tax-free using periodic payment arrangements if their claim is the result of personal, physical injuries. Safe Cash Flow – Cash flows are safe, secure, and funded with annuities issued by highly rated life insurance companies – most of which have been in business more than 100 years. Protected – Multiple levels of consumer protection rules ensure the safety of your payment stream. Stable – Annuity contracts are not subject to market fluctuations like the stock market. All payments are guaranteed subject to the claims paying ability of the issuer. Tailored benefits – You choose a payment schedule which can be tailored to pay for such necessities as future operations, school tuition and retirement. Only for Injury Victims – The benefits of a structured settlement are only available to those settling physical injury cases. Must be chosen prior to concluding settlement and cannot be structured after a settlement is finalized.